Everyone knows that operating a motor vehicle safely requires more than just fastening a seat belt; it entails many safety precautions. What is not commonly known is that safe cell phone usage is just as easy, but also requires a system of precautions. Each of the cellphone radiation safety accessories suggested in this video play a very important role in safe cell phone usage. Understanding when and how to use them all is very important. Back on the eve of the World Health Organization’s ruling on cell phone radiation safety, CNN chief medical correspondent Dr. Sanjay Gupta unveiled his own investigation into cell phone safety on Anderson Cooper 360°. Dr. Gupta discusses safety recommendations from both manufacturers and the Federal Communications Commission for various devices, including Blackberry and iPhone. Anderson Cooper and Dr. Gupta also discuss suggested safety precautions people can take, such as using a ferrite bead and Air tube headset. Avoiding use when in low signal areas was also advised. Bluetooth technology is mentioned as a way to reduce exposure. On this page you’ll learn how RF Safe made Bluetooth headsets even safer using patented air tube technology with a radiation shielded body clip. Hottest product in demand for 2014! WHY ALL THE FUSS OVER PHONE RADIATION SAFETY? The official findings, “radiation from cell phones can possibly cause cancer”, according to the World Health Organization. The agency now lists mobile phone use in the same “carcinogenic hazard” category as lead, engine exhaust and chloroform. NEW STUDIES EVEN PROVE HOW CELL PHONE RADIATION CAUSES CANCER AND INFERTILITY! Cell phone radiation damages DNA, inflicts cellular damage and creates a broad spectrum of health problems and diseases, including DNA mutation and cancer in humans. A group of scientist published this in a scientific journal “Oxidants and Anti oxidants in Medical Science” in March 2014, in a study called “Low intensity radiofrequency radiation: a new oxidant for living cells”. 76 studies (or 92.5%) proved that cell phone radiation inflicts cellular damage. 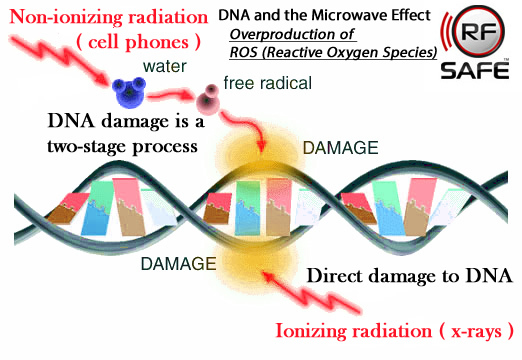 Cell phone radiation affects production of Reactive Oxygen Species (ROS); these are molecules that form in our bodies as byproduct during normal metabolism of oxygen. These studies show that the debate about cell phone radiation being hazardous or not is over, and it is time to create a public policy that will address these issues as bio-effects have been observed at a rate of 92 percent in 80 peer-reviewed studies. Therefore, it is important for governments of different countries to come together to create legislation that will limit cell phone radiation. There must be mandates for reduction in radiation levels by forcing cell phone manufactures and service providers to use different technologies than the existing ones which are available today (Vortis Technology as an example). 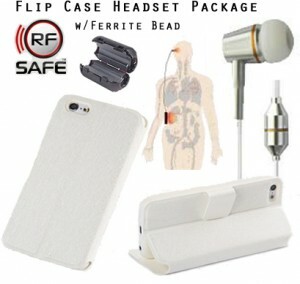 Alongside, users should be made aware of the possible side-effects of cell phone use, so that they can make alternative choices such as using an RF Safe headset and RF Safe Flip Cover Case Shield. NOW LEARN MORE ABOUT THE ACCESSORIES SUGGESTED IN CNN VIDEO FOR CELL PHONE RADIATION SAFETY! A hollow tube, similar to a doctors stethoscope allows air to transmit sound to your ears which keeps distance between your brain and any electronic components that can potentially radiate microwave radiation. The acoustic technology uses a patented air tube and sound chamber design to deliver crystal clear sound without radiation or electronics in your ears. RF Safe headsets are available in Mono ( single ear bud) and Stereo (two ear buds) versions. By replacing the wire found on ordinary headsets with patented acoustic air tube technology, the RF Safe headset reduces RF exposure to the head and increases the pleasure of listening to one’s favorite music on their smartphone. The latest innovations in RF Safe acoustic headset technology are now available for the newest smartphones on the market RF Safe’s 5th generation air-tube headset technology is available in six different colors (White, Blue, Red, Black, Purple, Green) and come in both stereo earphone (dual ear buds) or mono earphone (single ear bud). Conventional Headsets use wire to deliver sound to the earpiece and may also deliver electromagnetic radiation directly to your head into your ear. Millions of people with cell phones depend on a headset for driving safety. While others are concerned about health effects from wireless radiation have opted for using a wired headset instead of wireless headset to avoid “bluetooth” headsets because Bluetooth technology still transmits microwave radiation and could still be a health hazard at low levels. Unfortunately, it turns out that a headset’s wire can pick up microwave radiation that is transmitted from a cell phone and channels that radiation directly into a user’s head. Professor L Barclay, in 2005 found that microwave radiation from the cellphone travels along the wire from where it plugs into the phone to where it connects inside the ear bud to an electronic speaker inside a user’s ear. It’s important to note that an air-tube headset doesn’t have any electronics in your ears. RF Safe has a very simple and inexpensive way to reduce microwave radiation from traveling up a headset’s wire into the brain. It’s a special material composition, a ferrite bead. A ferrite bead is a small clip you put on the wire of a headset. The bead is designed to impede high frequency microwaves in the GHz range while allowing low frequency electromagnetic energy to pass through to operate the speaker to create sound in the Hz range. Low frequency energy is passed to the speaker that creates the sound needed to reach a user’s ears, but potentially harmful high frequency microwave radiation from the cell phone is impeded. This makes the ferrite bead a very helpful accessory for cell phone radiation safety. RF Safe suggest both of these products suggested by CNN in the video are used together for the most prudent avoidance of RF radiation. When using an air-tube headset there are no wires reaching a user’s head, and the ferrite is added for wire protection where the wire comes in contact with a user’s torso. 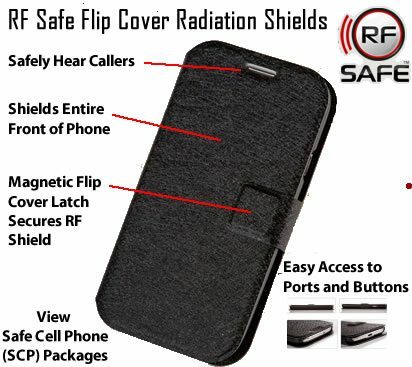 When RF Safe Flip Case Radiation Shields were being designed, extensive research was conducted to determine the most effective method of deflecting phone radiation away from the head and body of the user without covering the antenna or increasing radiation emissions of the cell phone. RF Safe methodologies for shielding radiation in a cell phone case use technologies to deflect radiation which is directed towards the users body (ie radiation only the user would have absorbed) and will not cause the phone to increase out-put power. 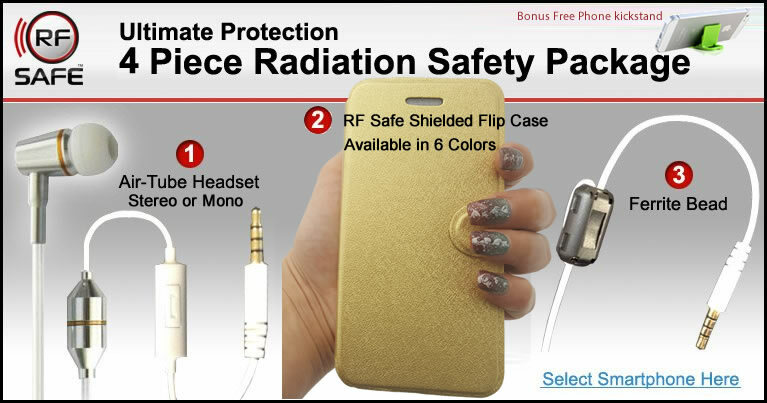 RF Safe put over a decade of phone shielding experience to work when developing Peel-n-Shield™ as the ideal solution for shielding radiation by accommodating the latest smartphone flip cover designs. Perfect protection when carried in a pocket, purse or even when used to the ear when an air tube headset isn’t an option. The flip screen cover is lined with soft foam to protect the phone screen and deflects radiation as a shield between the user and wireless device. Smart because it protect you from excessive phone radiation exposure. Smart because it protect your phone display screen. Smart because it enhances phone features – like fold out landscape media view.